The time has come to face the enemy! 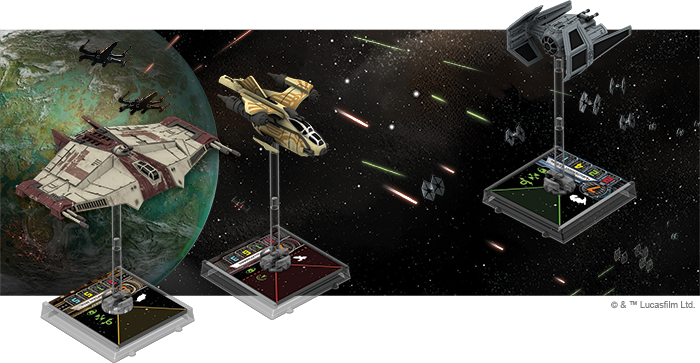 The eleventh wave of starship expansions for X-Wing™ is now available! With a trio of starships that excel in multiple roles, Wave XI looks to come in strong from the fringes of the galaxy, blast its way onto the battlefield, and boost all three of the game's primary factions as they continue their wars for the fates of countless star systems. From left to right: the Scurrg H-6 bomber, Auzituck gunship, and TIE aggressor. 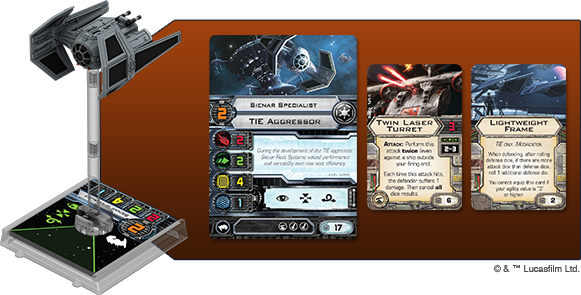 You can learn more about these ships and their pilots from our previews—"Play the Aggressor," "Defenders of Kashyyyk," and "Cry Havoc." And you can find them featured in the new mission, "Outer Rim Raid," which is available now for free download (pdf, 1.2 MB). 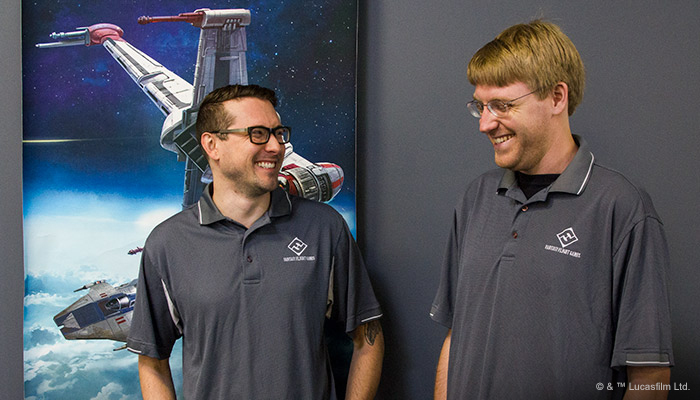 For even more information about the ships, pilots, and upgrades from Wave XI, we turned to X-Wing developers Max Brooke and Alex Davy. 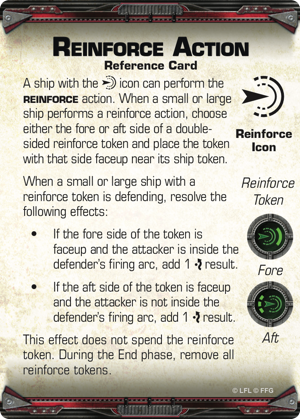 FFG: How did you settle on the ships in this wave of expansions? AD: Well, we're always looking to add something new with each wave. 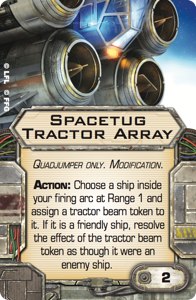 We saw that the Scum and Villainy faction was lacking a heavy bomber along the lines of the K-wing, the Empire had nothing with a turret slot, and the background of the Auzituck gave us a chance to adapt the reinforce action for small ships. MB: As always, the decision involved a lot of people. We proposed a number various ships, and got the go-ahead to move forward on some of them. Also, we had wanted to do the Scurrg for a while and had been waiting for the right opportunity. A 360-degree view of the Scurrg H-6 bomber. FFG: You mention that you're always looking to add something with each new wave. How heavily do new mechanics weigh upon your design goals for a wave? What other ambitions did you have for these ships? MB: One of our overall goals with X-Wing is to make sure that every ship has something interesting going for it mechanically. In this wave, it was less about pioneering major new mechanics—though there was a bit of that—and more about expanding into niches we hadn't explored in particular factions. We also wanted to play a bit more with double-slot upgrade cards. We had dipped our toes into that space earlier, but still had room to expand upon it. AD: Exactly. New mechanics are just tools to change the game. A ship with no new mechanics that occupies an unexplored area in a faction's roster can be just as much of a game-changer as a ship that introduces new mechanics. When the Rebels got the Z-95 in Wave IV, for example, they got an extremely straightforward ship that nevertheless opened up their list-building tremendously. Of course, the game has grown a lot since then, so these days we sometimes have to dig a little deeper to find those new niches. A 360-degree view of the TIE aggressor. MB: But sometimes it's not too difficult. I actually hope we'll see the TIE aggressor—and the access it grants the Empire to the Turret slot—help people open up some new Imperial lists, despite the fact it's an incredibly simple addition to the faction's arsenal. 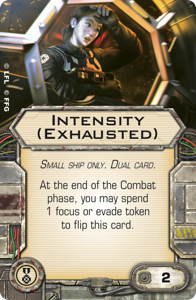 FFG: How do you feel these ships meet those goals? MB: The Auzituck is a pretty unique ship to fly. It's very tough, but because it doesn't have a K-turn or another maneuver that lets it flip around 180-degrees, you have to think about its movement patterns differently from those of other small ships. Even so, it gives the Rebels a ship whose arc can be very hard to evade, which means the Rebels gain some really interesting opportunities, such as with crew who care about your firing arcs. The TIE aggressor is a hybrid turret and ordnance platform, and its double missile slots open up some exciting opportunities, too, like Unguided Rockets . Despite the role overlap it shares with the Rebellion's Y-wing, it feels very different on the table—it's a lot more evasive and can use Lightweight Frame to get a decent agility. But it's much more fragile. 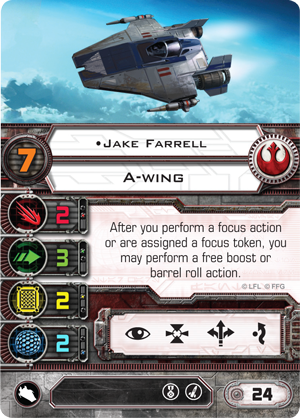 FFG: Plus the inherent barrel roll. How much does that change the ship's playstyle? AD: The barrel roll is a great tool for playing with range bands and escaping arcs—exactly what a ship with the turret slot wants to be able to do. 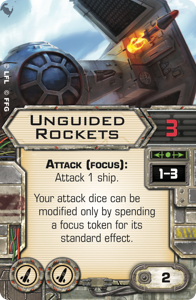 FFG: What were some of the craziest uses of these ships and their upgrades that you saw in playtesting that you now look forward to seeing out in the world? 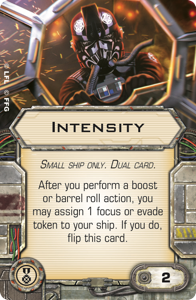 MB: Jake Farrell and the Intensity upgrade, from the TIE Aggressor Expansion Pack, is one obvious combo from the wave that raised some eyebrows. Ultimately, it stayed. But we tested it a lot. AD: Minefield Mapper had our playtesters digging around for every bomb token in their collections in order to blanket the play area with a truly rude quantity of mines. 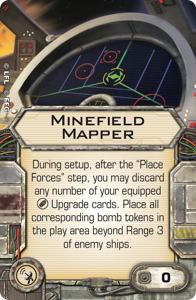 Minefield Mapper allows you to force your opponents to veer from their intended approach paths. FFG: How did that hold up in testing, and what did players say about the type of games it encouraged? AD: The mine-saturation lists turned out to be paper tigers because they had no follow-through. Minefield Mapper is like any other tool in the toolbox—it's a great support for a variety of strategies, but not necessarily a full strategy in and of itself. 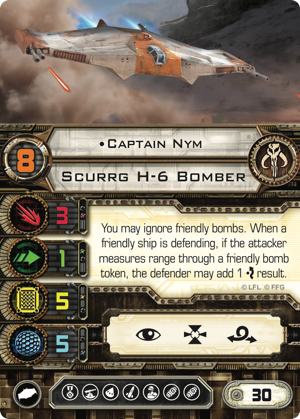 It is, however, a ton of fun with the Scum version of Captain Nym , for instance, because it allows you to set up some static defenses for your list to exploit in tandem with his pilot ability. 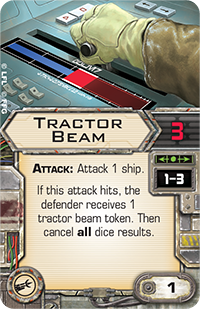 MB: There are some cool tricks people tried with Minefield Mapper and tractor beam tokens—via quadjumpers with Spacetug Tractor Array or other ships equipped with Tractor Beam . 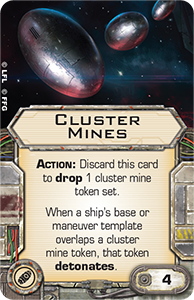 But it's a lot of work to set up, and you're usually trading attack power for the chance to hurl someone's ship onto a bunch of Cluster Mines . It can work out, but it's definitely tough to pull off. AD: It's definitely a card for the restless experimentalists in the community. MB: We also saw some very inventive uses of Minefield Mapper with TIE punishers. AD: It's true; that old war horse enjoyed a resurgence in testing. 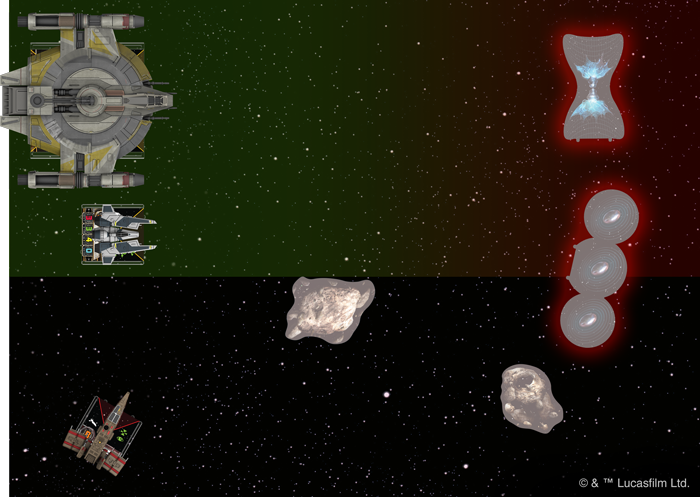 MB: A lot of the evasive Imperial aces can dodge around mines on the field pretty easily. The TIE Striker was especially good here. And Lightweight Frame and Unguided Rockets make the TIE punisher a bit more formidable, itself. The Imperial aces who can successfully evade all the mines strewn by a ship with Minefield Mapper may still have a hard time avoiding the Auzituck gunship's 180-degree firing arc. 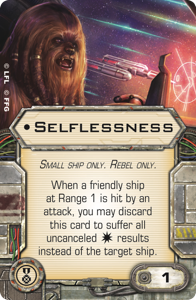 FFG: Okay, Max, this one's for you. You developed a new mission to highlight the ships from this wave. What can you tell us about this mission that's now available for download? MB: The mission is called "Outer Rim Raid," and it was designed to showcase the fact that the Auzituck, Scurrg, and TIE aggressor all lend themselves to flanking attacks. Accordingly, the mission brings them into play apart from the rest of your squadron and forces you to fly them at a different angle. This creates opportunities that flying your squadron as a single unit wouldn't, and reinforces the idea that they can all cover large areas with their attacks. In the case of the Scurrg, they can even threaten ships behind them with bombs, too. 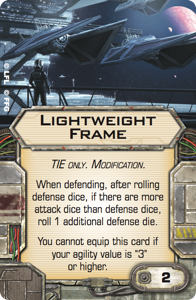 FFG: What do you expect to see as people start to fly these ships? MB: I'm really excited to see how people use the different tools we gave them in this wave. We strove to create ships and upgrades that did a lot with previously established ideas. 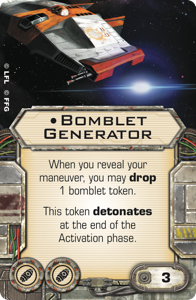 We've already discussed how the ships explore new niches with relatively few additional mechanics, and as to upgrades, I feel like Unguided Rockets, Intensity, Selflessness , and Bomblet Generator are all relatively straightforward cards that are nonetheless going to open up some very novel builds for new and existing ships alike! Even at the fringes of the galaxy. Even among the smallest independent mining operations. Even in the Outer Rim. There's no escaping the conflicts between the light and the dark sides of the Force. The Force binds and permeates all things. It draws them together, and if you don't wish to be destroyed by the forces that have aligned themselves with the dark side, you must join the fight against them. Conquer the galaxy or fight for freedom. With the new Wave XI expansion packs, X-Wing and its battles reach farther from the Core Worlds than ever before, and there's no telling whom they might pull into the center of events bound to change the lives of countless galactic citizens. There's no telling what adventures these ships and their pilots might hold in store. You'll have to discover them for yourself. Head to your local retailer to pick up your copies of the Wave XI expansions (SWX64-66) today!